Kitchen and Residential Design: I like chandeliers. There I said it. Confession time. Despite all of my barking about clear spaces making for clear thoughts I have a weakness for chandeliers. Not just any chandelier, but chandeliers never the less. I blame James Moder. James Moder made the first deconstructed crystal chandelier I'd ever seen and it changed everything. Until the day I stumbled upon one, I thought chandeliers were the sole province of elderly women and fussy designers. Moder's Broadway series had something to say and it very nearly made fun of the medium it was constructed from. Brilliant, really. Chandeliers have been around since Medieval times and they've been adorned with crystals since the 18th century. 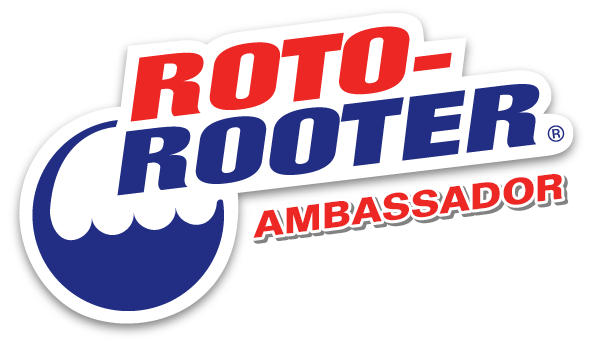 They are a world unto themselves, with their own vocabulary, their own manufacturers and sometimes, their own dedicated distribution networks. In the world of lighting, they hold themselves apart. They should. I swear they're an art form. 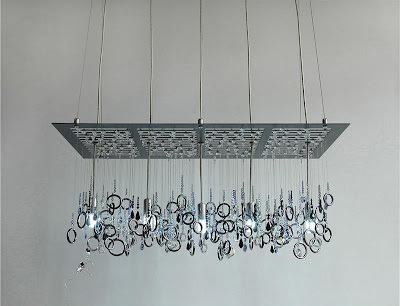 Dwellings, Ltd has a new collection of five chandeliers called Water Pressure. 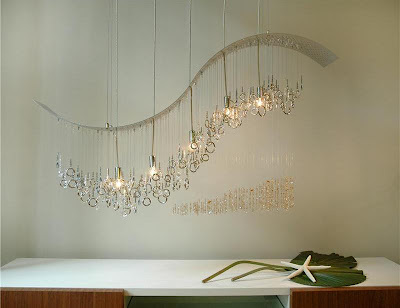 Each chandelier takes its inspiration from an example of falling water and then tells a very clear story. There's nothing subtle or implied, these pieces have a point of view. They are also hand made from jewelry-quality Swarovski Crystals. Crashing Wave is just that, complete with a shoreline. Lawn Sprinkler is a summer day in bare feet. Lather Up is a soaking shower. NYC Sewer Grate is rain falling through a grate as observed by mice. Irrigation is a farmer's field. That Crashing Wave is a wonder. And if that weren't enough, Dwellings, Ltd is offering free shipping to the US and Canada through April 15th. What do we think? Am I alone in my appreciation for the not-so-humble chandelier? 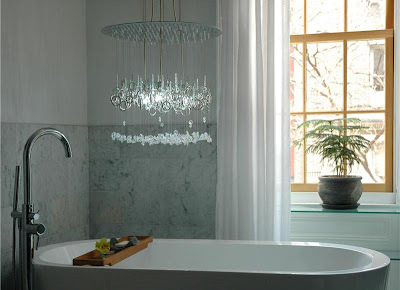 Chandelier fans, how does the Water Pressure series stack up? No way! These are brilliant! They are so beautiful!! I like that Crashing Wave so much it hurts. All pieces of sculpture in their own right. I'll pass along your compliments Brenda. I was on board until the corn. They lost me on that one too, but it's more than made up by Crashing Wave. While we're at it, I had to post my favorite. This would be in my home NOW if only it wasn't 10K!!! 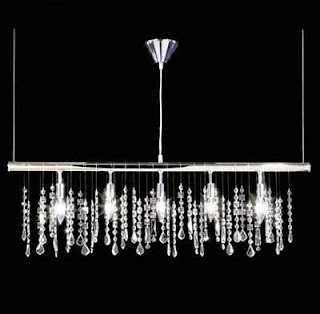 I enjoy seeing how modern designers have tackled the chandelier concept. They're not always successful. Many times all of those facets don't lend themselves to the sleek and streamlined look of today. The Swarovski site has some nice modern examples, as well. Yes, they are drop dead gorgeous (except the corny one) but, do they do the job? Do they light up a space? Would I be able to discern between tomato bisque and clam chowder? I go ga-ga in lighting stores and still come out with my credit card intact for this very reason. It's very sad-making. Erika: Holy cow that's a great chandelier and resource. Thanks for the heads up! Julie: I love it when they succeed and I think these do, even the corn. Nancie: It's a recurrent problem because most chandeliers aren't expected to do any real heavy lifting from a lighting perspective. This series seems to have a decent array of bulbs involved but I wonder how well they do in a room. They're sure pretty though. Anna: A Crashing Wave necklace would be a wild interpretation of that form, I'd love to see it. You're a mosaicist, do you know Nancie? Her comment's right above yours. I have a feeling you have a thing or two in common. I too thought chandeliers were for elderly women and fussy designers and had no intention of selecting one for my living room when shopping for a light fixture last year until I came across my true love. 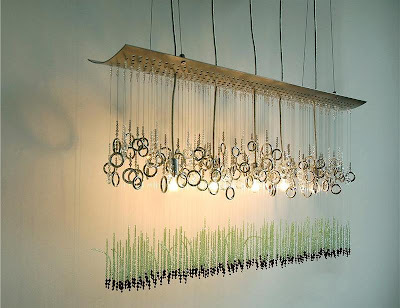 It is a chandelier from Aidan Gray. I asked myself why I loved it so much and realized that it reminded me of the beaded jewelry I had made for my wedding by the owner of the greatest bead shop in Raleigh, NC called Ornamentea (she used to make jewelry for Anthropologie, not sure if she still does). I think chandeliers need to speak to you - so to speak - otherwise you are faking it. 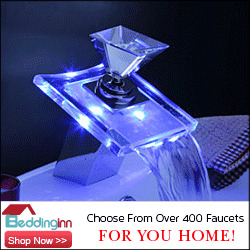 Not only does it look good, it illuminates the room beautifully. Those Aiden Grays are beautiful. Since I've already admitted my fondness for chandeliers I'll go one further and admit that I have small, uber traditional chandelier hanging in my bathroom. Thanks for the link. How's your blog coming? I can't get over these things. They're so tinkly and bright and sparkly. I can't stop looking at them. Ever see that Star Trek TNG episode in which Wesley brings someone brings back that mind-controlling game that addicts everyone? That's what I feel like looking at these chandeliers. I've never seen the episode you're talking about but I can relate to the mind control thing. That Breaking Wave is breaking my cold, cold heart. Bozena: Thanks for your comment! I think that's an unfortunate photo of Lather Up. The photographer's being cute and I cannot imagine that getting that thing anywhere near a bathtub is an intended use! That's funny Kelly, Erika posted a link to Ochre earlier today, though she's in love with a different chandelier. However, I was poking around on Ochre's site later and settled on the same one you did. Great minds Kelly, great minds. I'm utterly smitten with the modern chandelier... heck, for that matter with any chandeliers! These are all beauties! Thanks Toma! 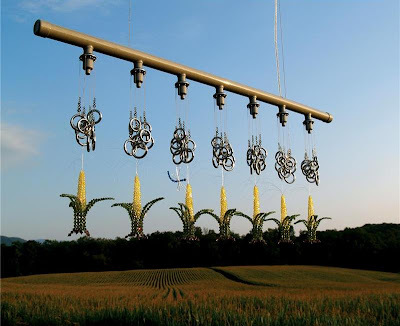 Have you ever seen what Philippe Starck's done with them? Light and crystal seem made for each other - the playfulness and whimsy of these (even the corn) are fantastic... the details certainly make them memorable. Thanks! I still love the beach chandelier and I'm not one for beachy gimmicks usually. This is not gimmick though.